Interplay Calls Bethesda's Fallout Claim "Absurd"
Interplay has responded to Bethesda's claim that it has no right to use any Fallout-related asset but the trademark itself in the development of the Fallout Online MMO, calling the idea "absurd." The legal battle between Bethesda Softworks and Interplay over the planned Fallout MMO took an interesting turn in December when Bethesda made the odd-sounding claim that its license agreement with Interplay included the Fallout trademark and absolutely nothing else related to the franchise. In other words, according to Bethesda, Interplay had the right to call its game Fallout but it couldn't actually make it a Fallout game. I said at the time that the idea struck me as kind of crazy and while my legal expertise begins and ends with Law & Order reruns (pre-Dennis Farina, thanks), Interplay's legal team seems to have adopted a similar approach, dismissing Bethesda's claim as patently silly. "Bethesda's interpretation requires Interplay to develop and release an MMOG under the Fallout name, but unrelated to the Fallout brand," Interplay said in a court filing made on January 7. "First, this is not only absurd, but is specifically prohibited [emphasis Interplay's] by the agreement because Interplay was only granted a 'license and right to use the Licensed Marks on and in connection with its Fallout-branded MMOG... and for no other purpose'." "It was not the parties' intent that Interplay create, for example, an online baseball game or poker game called 'Fallout'," it added. Much of the dispute appears to turn on terms laid out in various agreements between the two companies which occasionally superseded each other and left some points inadequately defined. In particular is the definition of "Fallout-branded MMOG" and how the "brand" differs from the "trademark." Bethesda claims Interplay was to create a game with the Fallout trademark but otherwise unrelated to the Fallout brand, while Interplay points out, rather sensibly in my view, that if it was forced to "divorce the trademark from the source of its good will, which stems from its reputation related to a particular and unique post-apocalyptic world," there wouldn't be much point in using the trademark in the first place. Interplay's filing also asked for permission to "present evidence to show the parties' intent with regard to the meaning of the term 'Fallout-brand MMOG'" to the court. The battle will continue, and we will keep you posted. 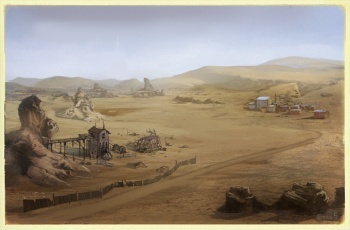 Sources: The Fallout Wiki and Gamasutra, with thanks to Ausir for the tip.